In mid-19th century Louis Pasteur defined the real nature of yeasts and their importance in the fermentation process, thereby increasing the knowledge regarding the preparation of alcohol. His research became all-important for oenology, marking a turning-point with respect to the old method of vinification. 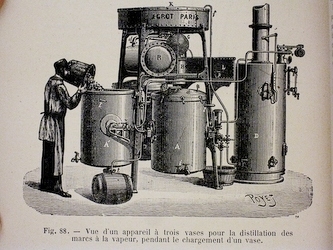 In the early 20th century, when the alcohol fermentation process was fully understood, important Italian and foreign scholars rationally applied it to the production processes, improving the distillation systems. This gave rise to the modern distilling industry and along with it, the commercial and fiscal need to accurately measure the alcoholic content of aqua-vitae. In this context, Enrico Comboni (1850-1900), founder and first director of the Conegliano Oenology Institute Chemistry Laboratory, improved the method for steam distillation of marc in an exemplary way. This method was all-important - even if with various subsequent modifications – considering that over 90% of the Grappa produced is steam distilled.